Part of the fun of planning your trip is getting out a good map and choosing where you want to explore. Guide books are very helpful with deciding where to drive and camp. 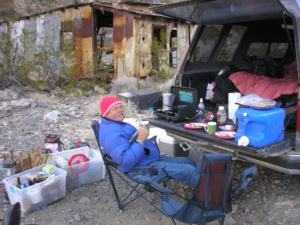 Just be aware that back roads and campsites can change dramatically due to the harsh elements. A favorite 4×4 road into Death Valley was impassable the last time we visited Goler Wash in 2015. A large rock slide had enveloped the road making progress so slow and rough it took the fun out of the journey – nearly an hour to travel 1 mile. We like the Goler route as it usually a “short cut” from the west side of the Panamints to visit the Barker Ranch, Stella’s Cabin, Stripped Butte and other scenic campsites. Otherwise it is a very long way around via the Park’s main highways. 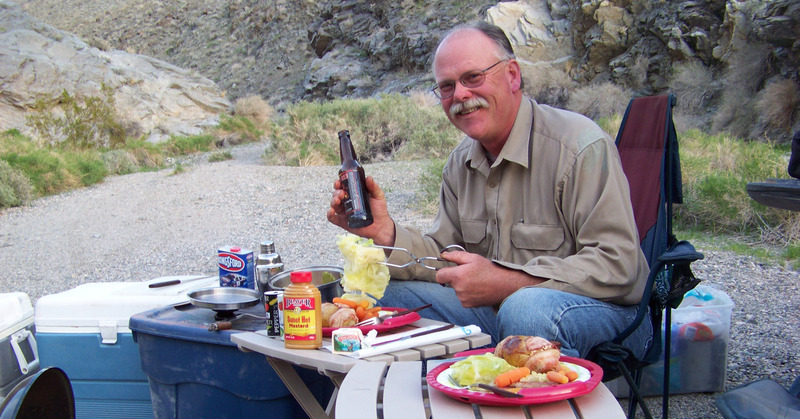 So, have a plan B for camping if the desert has changed the terrain from what your favorite guide book reads. I am posting a sample itinerary of a trip we took that you can customize to your own liking. I send out our planned itinerary to family in case we don’t come out of the back country and are in need of help. We have had to walk and hitchhike out in the past due to a disabled vehicle. What are the “camp potatoes” listed on my menu? These are a traditional staple on our menu that I prepare before our trip to cook on the BBQ while we sit outside to enjoy our camp spot with a drink and good cigar. Set the foil wrapped camp potatoes on the BBQ for approximately 45 minutes to an hour, depending upon the size of your potato. Squeeze (or poke with a fork) the potato to test if it is done. Unwrap and prepare your taste buds for a delicious treat.